Healing. An ambition and a vision. Healing. A call embedded in the wisdom to give in order to gain. A smile is an act of charity; sharing love and caring for others enhances prestige and position of the loving and the loved; of the caring and the cared alike. Sami Yusuf's new song "Healing" is a call to revive the caring aspect of human beings. "Healing" is a chance to vindicate all those best hopes one has about oneself and about humanity. It is an attempt to honor the small acts of kindness. It is a tribute to those who sacrifice and stand up for good even when it's hard, even when it's tough -- it is an embodiment of gracious generosity in practice. When and how did this project occur to you? How did the idea of this project start? British Muslim singer, song-writer Sami Yusuf released his new single “Healing” today (Wednesday) in cooperation with the International Medical Center (IMC, www.imc.med.sa). 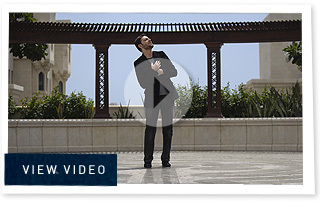 This is the official Sami Yusuf website, endorsed by Sami. Sami Yusuf is exclusively managed and represented by ETM International.